Developments in stamping-press technology since the North American introduction of mechanical-servo presses at the turn of the 21st century have continued unabated. Newer materials, and newer methods to form these materials, boosted by the need for parts designed with safety and weight in mind, have driven the press-innovation trend. So, what’s next? How about servo-hydraulic presses? Servo drives deliver benefits now familiar in the industry, and those benefits have migrated over to hydraulic-press platforms. The technology’s relative newness deserves a close look into just what it can do for metalformers. 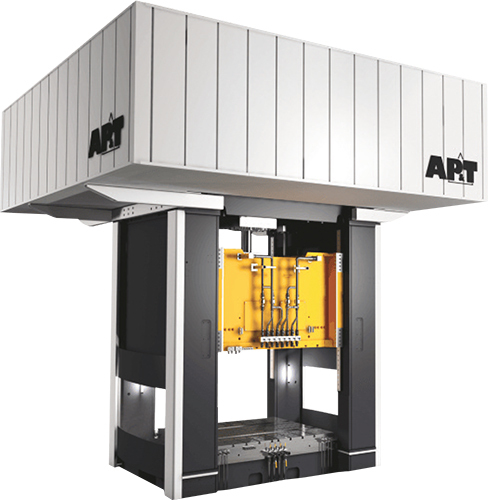 Toward that end, AP&T provided MetalForming with an overview of servo-hydraulic press technology and its benefits, along with some details on development of the company’s own hydraulic test press. As servo-mechanical presses have shown, the addition of servo-motor drives and controls enable programmability for stroke movement and force. Precisely dialed-in settings can customize a press for each particular job, tool and material, and allow for new ways to form new materials. Traditionally, mechanical and hydraulic presses each have offered specific benefits, with mechanicals providing higher stroke speed, simpler set up and maintenance, and high repeatability. Hydraulic presses deliver full energy throughout the press stroke along with freely programmable slide motion and energy control. Introducing servo motors into the hydraulic-press equation retains the stated advantages, with plenty more added. About 10 years ago, AP&T studied the idea of controlling hydraulic presses less via hydraulic means and more through the use of electric motors, offers Patrik Haglund, the company’s product manager for presses, and Troy Hamilton, sales account manager. This arose from energy losses that long have been seen as a disadvantage in hydraulic-press use—from the drive system’s motor-pump operation and from the hydraulic system, including pipes, valves and the main cylinder. This complex, high-strength-aluminum part provides one example of the capabilities and applications promised through the recent development of servo-hydraulic presses. Taking a new look at the studies when Haglund became product manager in 2014, AP&T found improved drive technology and developed its own press ideas, and thus an economic case to develop servo-hydraulic presses. The rise in automotive applications for high-strength aluminum also contributed to development of these presses. Forming high-strength aluminum requires relatively high press speeds and high accuracy, notes Haglund, but running hydraulic presses at higher speeds is challenging, and costly from an energy standpoint. Merging the benefits of servo-mechanical presses with the flexibility of hydraulic presses present a solution to that challenge. 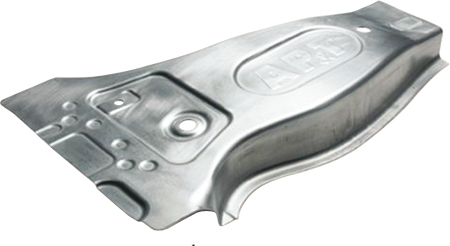 In fact, AP&T has developed a hot-stamping process to produce high-strength-aluminum parts in complex shapes that reportedly can reduce weight by more than 30 percent as compared to steel parts. This innovation arose in tandem with, and helped drive advancements in, servo-hydraulic-press technology, according to Haglund. AP&T is testing a 600-ton servo-hydraulic press, which benefits from a couple major advancements necessary when forming complex shapes from unique and new materials, such as high-strength aluminum, at production speeds. The biggest advancement—and advantage—in the company’s servo-hydraulic press is individual control of each cylinder via servo drives and hydraulics, according to Haglund. This allows parallelism between the press table and the slide even if more force is needed in one corner of the part or at different heights along the part. If needed, press force remains consistently high during the entire press cycle, he explains, and can be distributed with precision. This delivers efficient, energy-saving operation and less wear on tools and the press itself. In addition, maintaining such control means not having to overbuild dies to compensate for unexpected force. Redesigned hydraulics represent another advancement. With force and direction controlled via an electric motor, needed valves and other hydraulic components are reduced or eliminated, meaning significantly lower energy consumption, less noise and less maintenance. Haglund estimates a 30-percent reduction in maintenance time and costs as compared to a traditional hydraulic press, along with a longer service life. The reduction in energy usage translates to less generation of hot oil, which in turn requires less cooling components. Given these advancements, Haglund describes how servo-hydraulic presses in general, and AP&T’s new press in particular, provide benefits on the shop floor. With an automated lubrication system on this, you could seriously extend the machine life. MotionSource can do that.